Description: The Schantz family has been operating on custom solutions for the mobile food industry for over 60 years out of Illinois. Our business started with State Fair Concession Stands and Trailers, which we continue making to much acclaim to this day, and have begun working with the more street-based vendors in recent years. Our motto of “We Know What Makes You Money” has launched us well into this angle; we thus take the time to learn about your business, needs, and goals to ensure every detail is addressed and your chance for success is maximized. Experience in the fair and festival market has taught us the importance of efficiency, layout, and high capacity service. 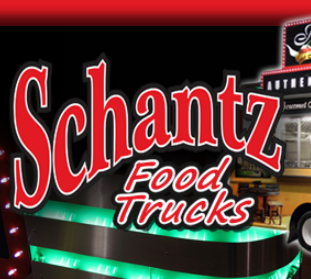 For these purposes, we currently stick with our standard 18′ Shantz Food Truck floorplan, with a kitchen designed to cooking almost any menu; with our history in them, we also offer Trailer options. Past Customers: Completely Sauced, Bunge M.O.E.